Professor Graeme Young presented at the Digestive Diseases Week conference in Chicago last week. (Medical Xpress)—A team of Australian scientists has presented evidence that a new blood test for bowel cancer based on two genes that "leak" into the blood can detect 65 per cent of bowel cancer cases. "A blood test is likely to overcome some of the barriers to screening with faecal tests. It might prove to be acceptable to those failing to participate in screening using established methods, which at the moment are primarily based around faecal tests," Professor Young said. "If this test becomes available in the future I think the message would need to be that the faecal test is the best place to start for people who are due for screening. Then the plasma test would be for those people who can't or won't screen with a faecal test," he said. 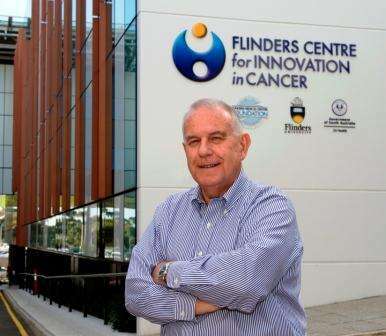 "The test is covered by a range of pending patents and these new data give reason to be optimistic about the prospect of improving screening rates by providing another option for people who can't or won't screen for bowel cancer using home-based tests ," said Dr LaPointe. According to Dr LaPointe, the test could be available in Australia on a "user pays" basis as soon as early spring 2014.